by The Ubud Team With the Japanese occupation from 1942 to 45, however, the celebration of a new bohemian paradise was temporarily suspended. Ubud's rulers both struggled against and co-operated with the Japanese in efforts to preserve their cultural heritage and their sphere of influence. When the Japanese were defeated on the global battlefield, the Dutch tried to regain control, but on 17 August l945 Indonesia declared its independence under Sukarno. 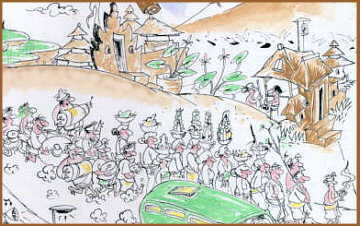 Four years of fighting with the Dutch ensued, and many Ubudians were imprisoned, including members of the royal family, who took a leading role in the Dutch attempt to establish an alternative government in Bali. In l949 the Dutch capitulated to the new Republic of lndonesia, and once again Ubud became very chic with those in the know as the government of Bali slowly opened its doors and its bank accounts to tourists. In 1965-66, a coup in Jakarta and its repercussions led to a chaotic campaign to cleanse Bali of "communists," and at least 5% of its population was massacred methodically or by mobs run amok. Ubud was not excluded from the bloodbath, which at times ran along class and caste lines, and in certain interpretations, reflected a consolidation of power among the Balinese "of caste," in response to the threat of a people's movement demanding land reform and the revocation of hereditary privilege.